Please select a size. EU 38 - Low StockEU 39 - Low Stock Please select a size. Steal the show on your next night out wearing the ultra-bold Pulse heel from Public Desire. 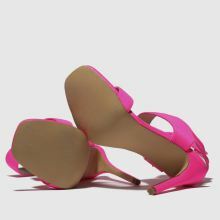 The neon pink man-made upper features chunky ankle straps as well as a squared toe for a modern feel. A 10cm stiletto heel completes this chic out-out look.